Yes, it’s been a while since I have updated my website. Regrettably I have a tendency to postpone this task. For those who do not know me, I love to spend real time with my family and friends. I also enjoy cooking, gardening, traveling and playing in my art studio, repurposing garage sale finds or painting works of art. Yes, I drive a minivan. I know it isn’t cool — but I can easily fit my 10-foot ladder in it and so much more! 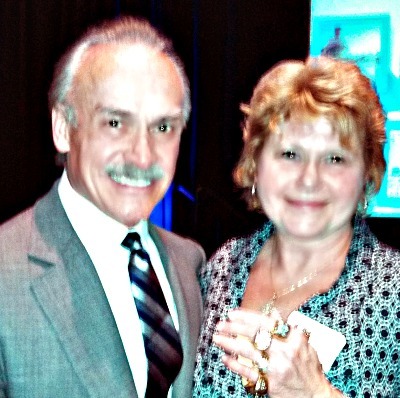 As a longtime Steelers fan, I had a rare opportunity this past year to meet former Steeler Rocky Bleier, a four-time Super Bowl champion — and I was thrilled to feel every one of his four rings on my fingers. He is not only a respected football player from our team’s glory days, but more importantly, like my husband, he is a Vietnam veteran — doubly respected! I feel very fortunate that I’m able to do what I love on a regular basis, designing customized finishes for my client’s walls, ceilings or furniture. I have done some amazing projects since my last update, working in beautiful homes with a diversity of decor styles — formal, casual, contemporary, coastal, Charleston chic, eclectic, primitive, transitional and old world Italian. Check out the photos in the various categories, including ceilings and furniture. Words to make customers smile at a Mexican restaurant. Last fall I worked multiple projects in a new construction Mexican restaurant in Surfside, SC. 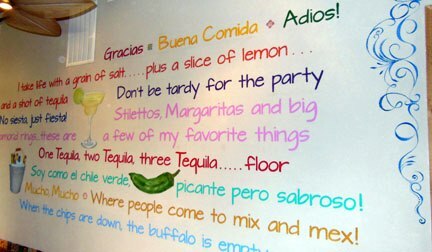 My favorite was the graffiti stucco wall in the party room, with hand painted phrases and graphics. These included a 3-foot high margarita, a bucket of beer, a hot chile pepper, a hot couple and the ‘Ole’ serape done in trompe l’oeil style. As always, the best parts of the past year have been the time I’ve spent with friends and family. I’ve enjoyed the visits to my home here as well as the opportunities I’ve had to travel. 2011 was a fantastic year because I worked with the most pleasant clients and interior designers on so many diverse and imaginative projects. The jobs included backsplashes, ceilings, hand-painted artwork and design, furniture, a fountain, and countless square feet of glazed and plastered walls. Is it any wonder why I love my job so much? Every job is unique and personalized to my customers’ desires and decor. Take a look at some of my 2011 Projects. In September, I attended the Faux Expo in Orlando, another week of good times with other artists talking shop and current trends. I took two great painting classes with Bonnie LeCat and Patrick Kirwin, and attended a remarkable seminar with William Cochran, my trompe l’oeil mentor. I arrive home refreshed, inspired, and excited to begin another project. This year began with a bang working in two picturesque ocean-front condos with multiple projects: four ceilings, two medallions, glazed walls, and one small mural. In January, I also created a Designed Impressions display booth for the Myrtle Beach Area Chamber of Commerce 60’s Theme Member to Member Expo — lots of work, but lots of fun. Recently I completed a canvas painting as a donation to a silent auction with proceeds going to the Coastal Animal Rescue in Murrells Inlet, an all volunteer, no kill, no cage facility. 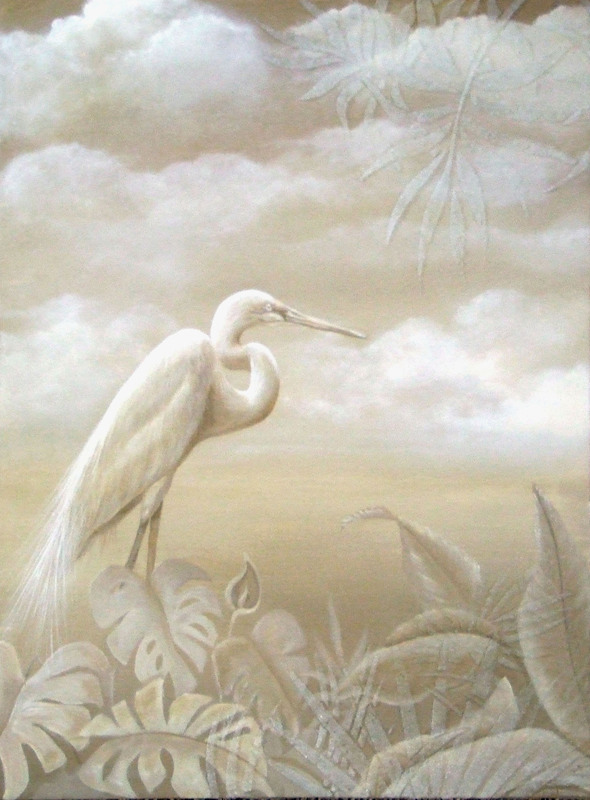 This piece was inspired by the soft serene grisaille style bath I completed last summer. I look forward to the probability of more artistic ventures in the coming months. My next project is in a new construction home in the Market Commons – tone on tone stripes, a three color Lusterstone, and a multi-toned plaster ceiling embellished with hints of antique gold. Yes, I am so blessed and fortunate to love doing what I do! Even though spring is just around the corner, many of us are spending more time indoors because of the cold and sometimes dreary weather. Although there is still a bit of apprehension with budgeting money for our interiors, a cheerful environment can lift your spirits, relax your soul, and help you to de-stress. As we progress into a new year, I would like to suggest a few ways how you can renew your space even on a tight budget. Paint is still the most inexpensive way to change the entire look of a room and sometimes all it takes is one feature wall. You can get a lot of bang for your buck if you make one wall or ceiling special with an eye catching technique; from an old world wash to a metallic plaster. I now see a trend with customers spending a little less but getting so much in return with smaller projects. I recently worked on a feature wall behind a bed using stencils then glazed with a linen finish technique. 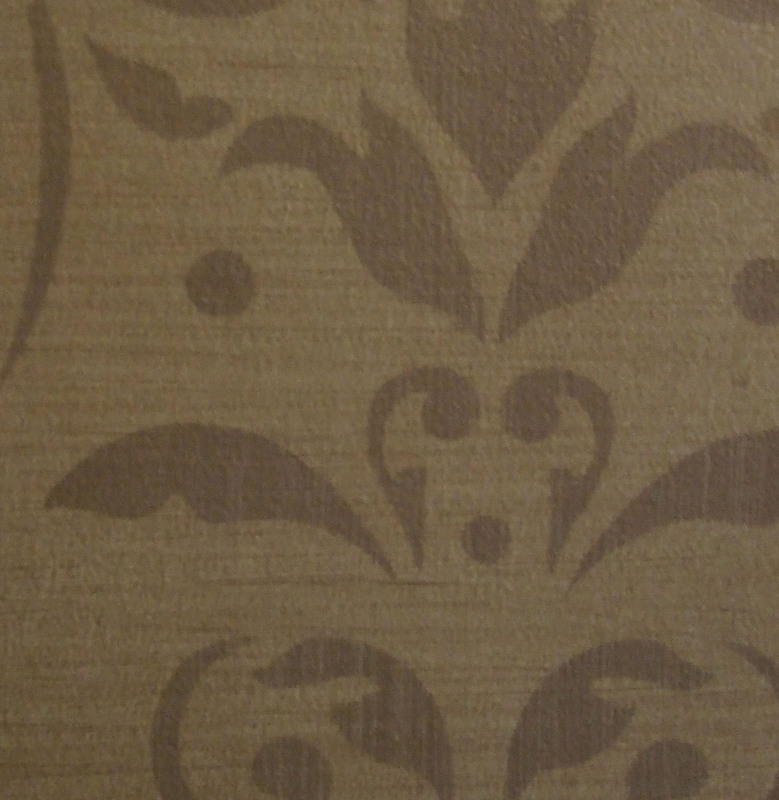 The design coordinated with a pattern found in the adjoining bathroom. I am not referring to a priceless antique, but old worn furniture can greatly benefit from a new life. Styles of painted furniture can range from country or Charleston chic to European hand-painted. 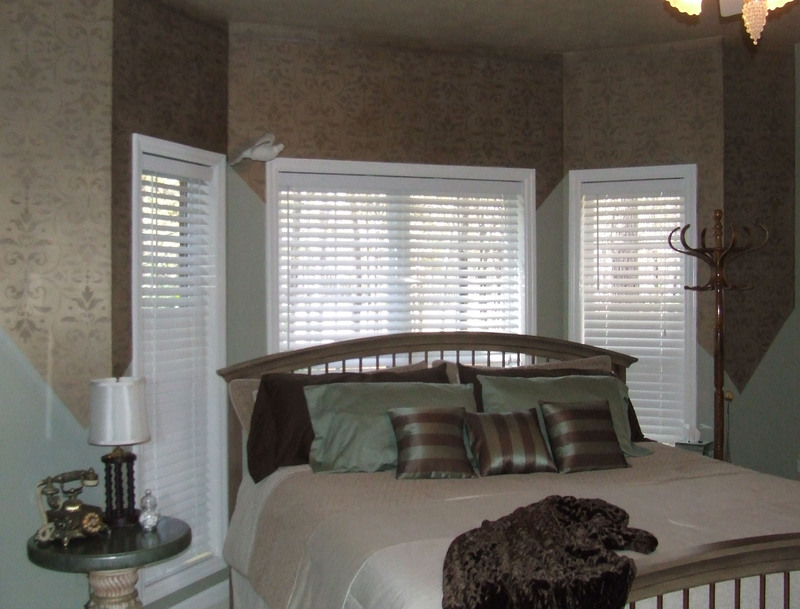 Revamping may include a new color, maybe metallics, or a fabulous textural design. Check my furniture section for photo examples. Unless you plan to spend considerable money to get quality in new furnishings, investing in an older piece is wise because it is typically made of solid wood and better constructed; it has already stood the test of time. Many items in my own home are hand-me-downs or flea market finds that are now unique originals. Repurposed accessories and new customized pieces are like the jewelry in the space, it completes the interior decoration. Perhaps you received something as a gift or have items that worked well with your old color scheme but no longer fit your new one. I often say, “You can paint anything — as long as you prep it properly.” You can re-do frames or change them out for a fresh unified design. 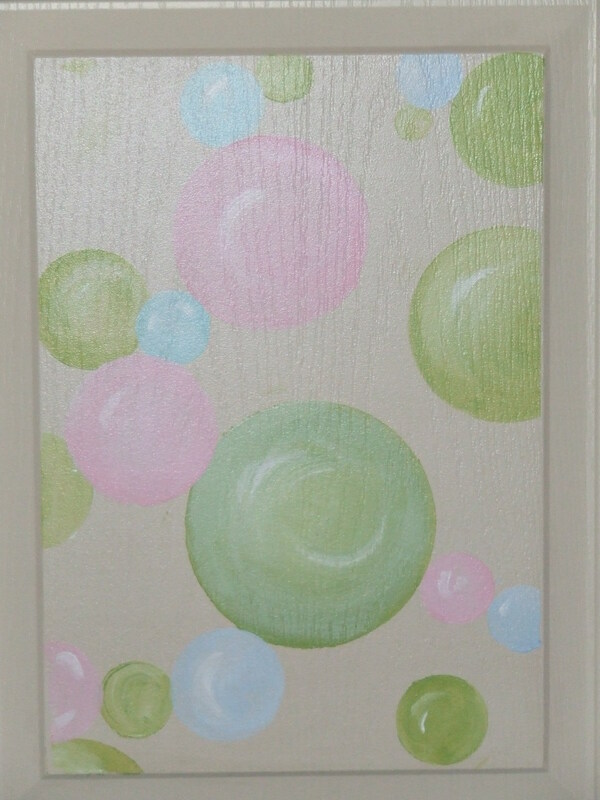 New items may include personalized floor cloths, distressed mirrors or wall hangings tailored to fit your space. Remember, living a thrifty lifestyle does not mean living with less style or good design. Your home should reflect your personality and be a relaxed comfortable haven. Give me a call to see what I can do for your space, working within your budget; I offer free consultations within a 35 mile radius. Let A Professional Artist Decorate Your Home or Office This Holiday Season! There’s no doubt about it. This is the season of joy and wonder—and absolutely incredible, often unrealistic, expectations. Cleaning. Cooking. Shopping. Parties to attend. People to visit. Places to go. Between what you want to do and what you’re obligated to do—at home and at the office—time and energy are in short supply. You may not have the inclination or ability to transform your home to the winter wonderland of your dreams. But now you can celebrate the holidays in style, without the stress. Let us do the decorating for you! We create one-of a-kind holiday decorating for the discerning client, customized to your wants and needs. Our cohesive and current holiday décor will accentuate your existing space. We offer a free or low-cost consultation (depending on your geographic location) to evaluate your space. We’ll give you a design proposal personalized to your style—whether you favor traditional, contemporary, rustic, elegant, vintage or a more eclectic look. From design, installation and takedown, in both commercial and residential settings, your needs will be fulfilled in a professional and timely manner. The holiday decorations will be installed with a fresh, artistic eye—customized to your needs (with or without a Christmas tree, with or without post-holiday take-down and pack-up service). We’ll provide several options, based on the number of rooms, and alternatives you select. 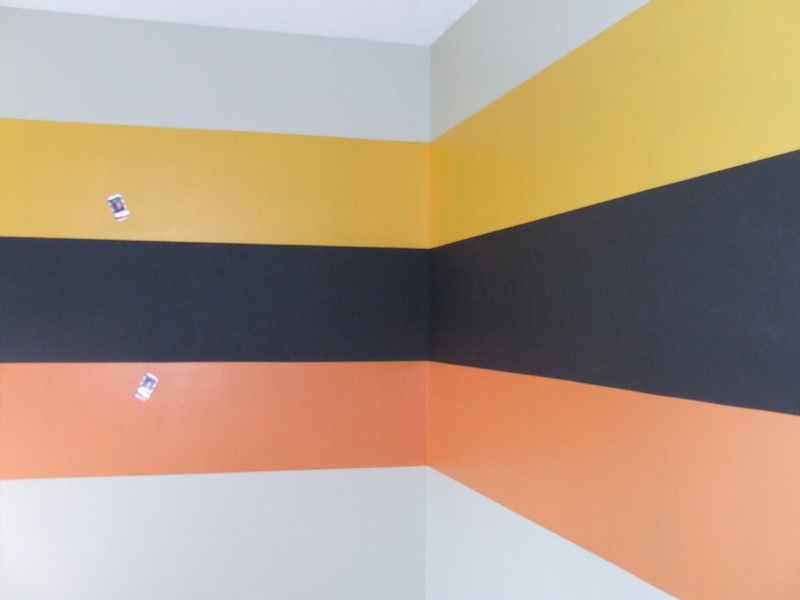 Prices vary, but our minimum charge for any decorating job is $150. If you live within a 35 mile radius of Murrells Inlet, we’ll be happy to provide a consultation free of charge. There is a $75 time and travel charge if you live beyond 35 miles. The New Year of 2010 presented various opportunities – multiple projects in a 12000 sf Italian villa, glazing kitchen cabinets, numerous furniture pieces, a few commissioned works of art including a 4′ X 6′ hand-painted canvas floor cloth, and two framed antique distressed mirrors. I have two very dear friends, Carla and Terri, who are also decorative painters. We generally work alone, but partner as necessary to complete larger projects. This past spring, Carla’s husband was in a dreadfully serious accident. Terri and I helped out by working on two out-of-town jobs which Carla had scheduled but obviously could not complete. It has been a difficult and grueling time for both Carla and Smokey, and I pray for his recovery. Recently, I visited my four out-of-state grandchildren ages 2, 5, 7 and 11. We all had so much fun with baking, shopping, swimming, football practice, and of course, decorative painting! 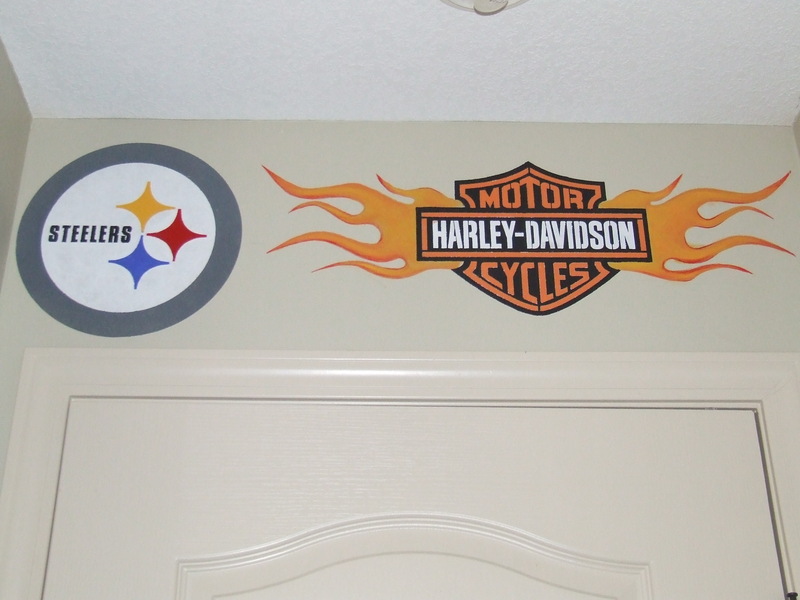 With the boys being avid football and Harley fans, I painted 18″ stripes across two walls using chalkboard paint sandwiched between magnetic paint with the Steeler and Harley colors as a topcoat. Then I added the logos above their door. 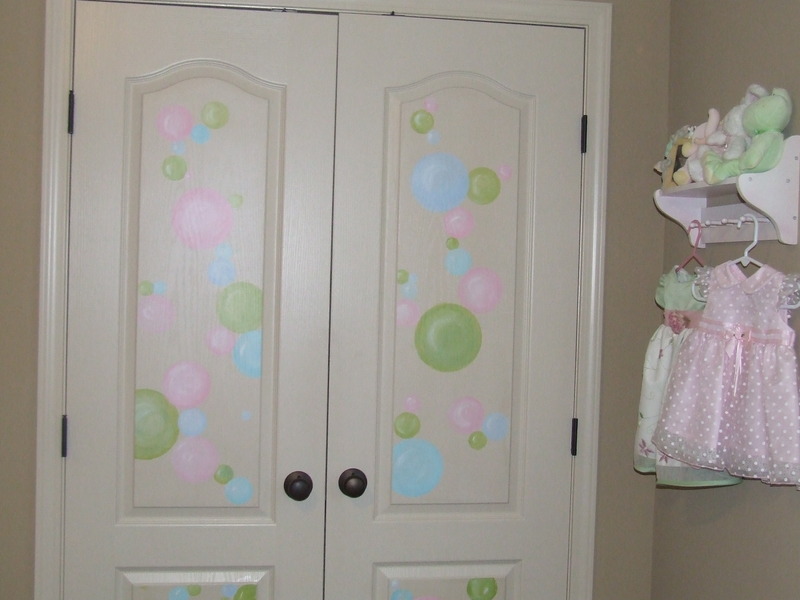 With limited time left, I chose to do a little something in the girls room with ‘pastel bubbles’ painted on their closet door panels. My young ‘clients’ were very pleased! In closing, I wish everyone a happy and healthy summer. Keep in mind, even with the economic downturn, I can work within a budget and develop cost-effective ideas for your design needs. The past few months have flown by rapidly. I completed several projects, including ceilings, murals and a ‘bejeweled’ powder room in a magnificent 18,000 square foot home. I have traveled to Punta Cana, Pittsburgh, Las Vegas, San Diego, New York City and Kansas City. In some cases, I visited family and friends. But other trips were just for adventure. No matter what the reason, I find myself amazed by the architecture and design encountered on every trip. 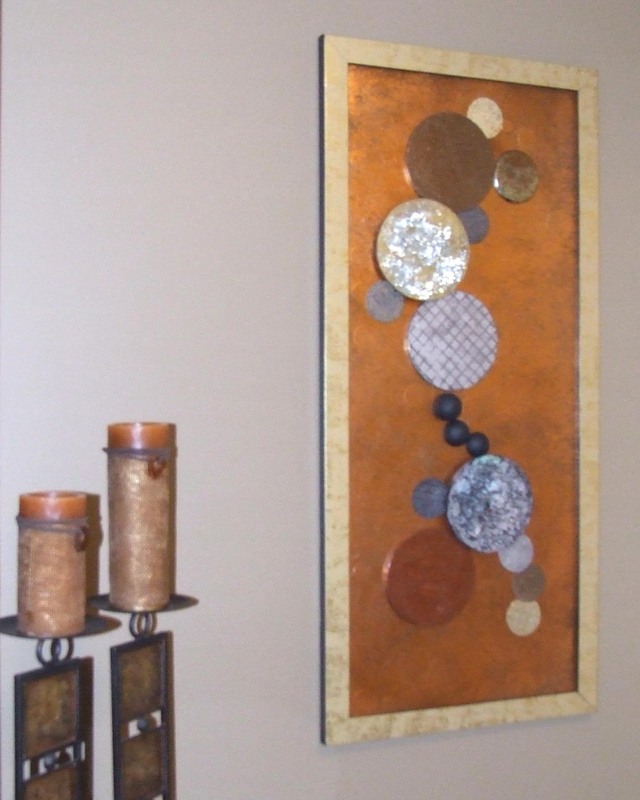 In my free time, I completed projects in my own home and finished a commissioned piece: a contemporary project that combined a few of my faux products into a textural, three-dimensional abstract. Besides being aesthetically pleasing, it served as a cover-up for the all too prominent electrical box in the hallway of the client’s condo. It was a fun project, and inspired me to consider the term ‘functional faux’. In this case, we camouflaged a less than desirable feature with creativity. But minor flaws can be also be minimized with artistic flair, and even worn cabinets and furniture can be revived at a fraction of replacement cost. I’m currently working on sketches of local low country scenery, including beach, marshes and indigenous animals, as well as a rendering incorporating palmettos with the South Carolina state flag, flower and related icons. These drawings will serve as drafts for murals I’ve been commissioned to paint in the entry and halls of Waccamaw Middle School in Pawleys Island. I’ll work on the project while the students are on summer vacation. 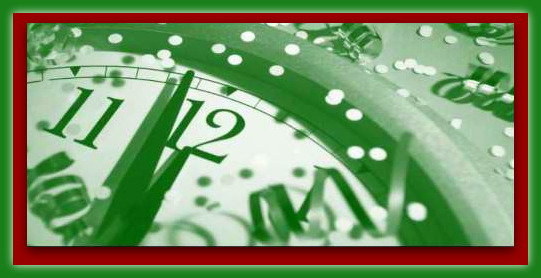 It’s once again that time of year when our thoughts turn to spending time with family and friends. For me, that begins with Thanksgiving. I look forward to seeing my family arrive from various states to live together–for a week of chaos, laughter and fun. I have late nights with the adults and early mornings with the little ones. A more recent tradition, which I now hold dear to my heart, is the Hospice Tree Volunteer Project. In 2003, as a member of the Friends of Huntington Beach group, I began decorating a live tree that is auctioned to benefit Tidelands Hospice. I have great respect for hospice workers because one in Pittsburgh helped me immensely with my mother’s passing. I have been chairing the committee the past five years, working along with friends: Ann Westcott, Cheryl Reilly, Pat Lyons, Sharon Riggs, Marge Mugno, Vickie Kron, Sue Green, Charline Rice, Kim Merkel and Karen Korszeniewski. Since we have a very limited budget, we become incredibly creative with found objects and have a lot of fun in the process. We began earlier this year and amass more than 200 ornaments. We decorate the tree in early December. I have many reasons to be thankful, including a great family, good friends and a job I love. My hope for the season: that we all remember what really matters, our families, our friends and our faith, whatever we believe. Have a blessed, safe and Happy Holiday! In October, I went to Toronto to acquaint myself with a less familiar professional product line. 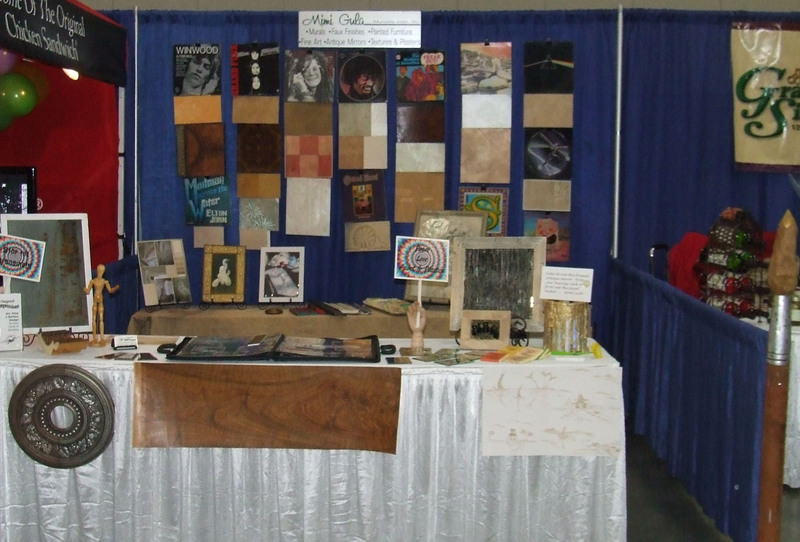 I brought home several new sample boards, but one in particular earned the ‘best of show’ title. This was an Italian lime plaster, which makes a very convincing stone appearance. I recently completed this technique for a client and we were both totally thrilled with the results. See the before, after, and close-up photos.